Properties of Sulfuric Acid: Clear, colorless, odorless, oily liquid. Very corrosive! Has a very great affinity for water, abstracting it from the air and also from many organic substances; hence, it chars sugar, wood, etc. Uses: In fertilizers, explosives, dyestuffs, other acids, parchment paper, glue, purification of petroleum, pickling of metal. Caution: Corrosive to all body tissues. Contact with eyes may result in total loss of vision. Skin contact may produce severe necrosis. 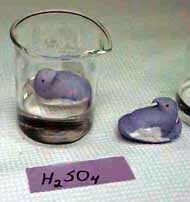 Sulfuric acid had no effect on the Peep whatsoever. As we noted earlier, this was quite a disappointment, as sulfuric acid and sugar can yield a quite spectacular reaction. Perhaps this is part of a new strategy for the Just Born company. As air borne sulfur increases due to continued industrialization, we can expect levels of acid rain to rise. All that acid rain could fall on a variety of Easter candy products, causing them to dissolve or turn into lumps of black carbon. Using these revolutionary acid-resistant Peeps could insure that long after all other candies are gone, Peeps will live on.